If there’s one thing I’ve learned throughout this whole process with Hannah’s knee tumor it’s to never count on any answer being the ‘final’ one. The whole process has been a rollercoaster and every time we think everything’s done and taken care of (for now), we get referred to yet another specialist. Not that I’m complaining necessarily – believe me, I want to make sure that every possible thing is being done to ensure that this tumor doesn’t come back or spread anywhere else. It’s just been very nerve-wracking. I’ve now learned not to promise anyone (and especially Hannah) that we’re done with doctors, appointments – or apparently with surgeries either. At the beginning of March, we’d gotten the ‘all clear’ on the scans that were done, which was a huge relief. Hannah’s oncologist (Dr. M) was recommending that we wait 3 months and repeat the MRI and then repeat the CT scan in 6 months. Ron and I breathed easy for the first time in over a month and I happily reassured everyone who asked that Hannah was doing great and back to being her normal 10-year-old self. Then last week, I got a call from Dr. M, who very apologetically explained that Hannah’s case had been presented at ‘tumor board’ several times and there was some ‘trepidation’ and controversy among the oncologist on the boards as to whether the surgical approach that had been taken was actually enough. In particular, one of the doctors felt that he wanted to see Hannah in person and talk to us about whether another surgery would be warranted. Dr. S is an Osteopathic Oncologist, who specializes in tumors. It was hard to tell Hannah that we were going to have to take her out of school for yet another appointment with another doctor for her knee. This knee of hers is apparently becoming quite well-known! We weren’t sure exactly what to expect, but we scheduled the appointment and drove back into downtown Grand Rapids yesterday morning to find out. After the usual taking of weight and height and such. we were seen by Dr. S’s PA and then Dr. S came in, took a look over Hannah, asked a lot of questions and explained his concerns to us. Now I’m not a doctor by any means so I apologize if I’m not totally accurate in trying to recount what was discussed. This is my understanding of it though. Dr. S sat with us for quite a while and was very thorough in his explanations, which we really appreciated. He answered all of our questions and the one question that Hannah had. She’s so quiet during these appointments – it’s hard to know what she’s thinking and feeling. Unlike both of her sisters, Hannah doesn’t wear her emotions on her sleeve, so we tend to keep asking her if she understands and if she’s ok. She takes all of this so well – but during this visit we saw her brave façade crack a little bit. Essentially… Hemangiopericytomas are a rare tumor, which we knew. I don’t think we knew how rare though – according to Dr. S, when you compare it to a more commonly seen type of cancer like breast cancer, if there are 20,000 cases of breast cancer a year, there are maybe 20-30 hemangiopericytomas. And many of those occur in infants or adults, so when you’re comparing kids Hannah’s age, there are very few cases and not much research. What little research there is however, indicates that in kids this tends to be a very aggressive tumor, which indicates an aggressive approach in treating it. All hemangiopericytomas that occur in people under the age of 18 get classified as Infantile Hemangiopericytoma, which is somewhat misleading since obviously Hannah is not an infant. And this type of tumor acts differently in infants – when it occurs in an infant, it can tend to become benign on its own over time. My guess is that this is why the dermatologist and original surgeon did not seem overly concerned about the tumor since it was classified this way. But since Dr. S specializes in tumors and has researched this type specifically and even seen a few of them before, he is better equipped to know how best to treat it. What Dr. S is recommending is a ‘wide resection’ of the tumor – which means taking out the tumor itself (or in this case the original scar and scar tissue since the tumor is already gone), along with the skin and tissue around it. Although the original surgeon felt confident that he got all of the tumor, it seems that there can be microscopic tumor cells that ‘seed’ the tissue surrounding it, especially during any bleeding that took place during the original biopsy. Dr. S was very glad to have the photos that I took of the tumor and had previously sent to Dr. M – he said it was extremely helpful to see the original size of the tumor and how the area looked right after the original shave biopsy. If Dr. S had originally seen Hannah, he would have done this type of surgery to begin with. And he feels strongly that this is the best approach. While radiation also could be a possibility, he doesn’t recommend it right now because a) we’re talking about an area right at two growth plates and he would be concerned with radiation affecting the growth in her leg, which could lead to leg length discrepancy and potential surgery for that down the road and b) radiation can cause stiffness in the joint, which can sometimes be permanent. In his opinion, surgery is the best option for Hannah right now – if we make sure to get a wide margin around the original tumor area, then she has the best chance for the tumor to be completely gone and not reoccur. This next surgery will be a lot more invasive than the first, since he’ll be clearing out a lot more area of skin, tissue and muscle. This means that the recovery will be a lot more difficult as well. Ron and I are in complete agreement that this is the best option – we want to do everything possible to make sure that Hannah remains cancer-free, of course. It’s just going to be difficult to see a normally very active little girl be sidelined for weeks, if not months. We don’t fully know the extent of what Hannah’s recovery will be like yet either, since until Dr. S actually gets in there and sees how much area he needs to take, he can’t tell us for sure if he’ll be able to simply close the incision over using the existing skin. If he can do so, then Hannah will likely only be in the hospital overnight and then home with a brace on her knee to keep it straight and using crutches for 4-6 weeks. In that scenario, she could go back to school as soon as she felt ready. However, it may be that Dr. S needs to remove enough of the knee muscle that he’ll have to use a portion of her calf muscle to replace it. Apparently there are three muscles in the calf, and one of them is redundant – so that it can be used to replace lost muscle in the knee if necessary. With some physical therapy, the leg retrains itself to function just fine, especially in kids. Also, if there’s not enough skin left to use over the incision area, he’ll have to do a skin graft. If that’s the case, then we’re looking at a much longer recovery time, with 4-5 days in the hospital and they’d want her to be home from school for four weeks, plus time in the brace and crutches afterward. 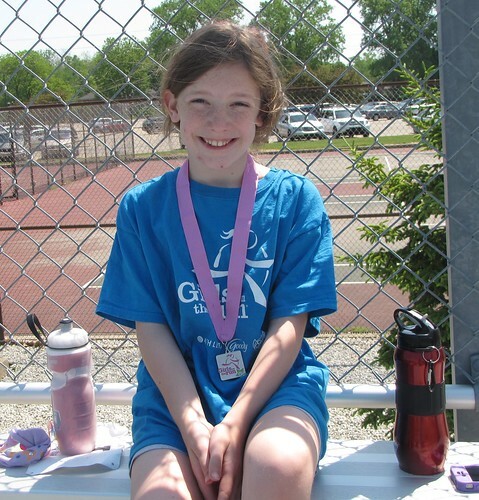 Either way, Hannah’s going to be unable to finish out her season for Girls on the Run this spring – and won’t be able to participate in the spring soccer season either. It was at this point when Hannah realized that soccer was going to be affected, that she came close to tears. The only question she asked of Dr. S was how long it will take for her to be ‘back to normal’. He thinks that after 3 months she’ll be probably walking normally again and in 6 months will be back to herself and able to play sports again. I think Hannah was getting at whether she’d be able to play soccer again in the fall, and it seems likely she will if everything goes as well as expected. At this point, the surgery has been scheduled for April 11th, but that may change since Dr. S will need to coordinate with the plastic surgeon as well. He felt that there’s about a 4-6 week window that he was comfortable waiting – Ron and I had asked that question since we were thinking it might be possible to wait and do the surgery after school and spring activities are done. But given that it will already have been almost 2-1/2 months since the original surgery, Dr. S just doesn’t feel we can wait that long. So we’re going to go with as soon as we can so that she’ll be more recovered for the summertime and hopefully able to still enjoy summer activities and such. I will be gone in early April for the annual TravelingMom blogger retreat, so we’re going to do the surgery right after I get back. I feel comfortable that this is the right approach and I’m glad that we’ll be giving Hannah the very best shot at remaining cancer-free. I still hate even thinking the word ‘cancer’ in conjunction with one of my kids – it seems so surreal. The only hard part right now is not knowing beforehand about her recovery – I’m a planner by nature, so it’s driving me crazy that we can’t really plan ahead very much. I figure that we’ll need to at least be prepared for the skin graft/longer recovery option in case it does go that route, but am definitely hoping and praying for things to go the easier, faster direction. Between now and surgery day, my goal is to give Hannah as many opportunities to be active and run around as possible – although Mother Nature is not very cooperative right now. Tomorrow’s the first day of spring, and today we’re having several inches of snow fall with heavy winds. Since Hannah’s soccer team won’t start practices until after her surgery (actually the first scheduled practice is the same day as her surgery, sigh), I’m going to try and see if I can get a scrimmage together with some of her friends and current and former teammates, maybe during spring break in a couple of weeks. 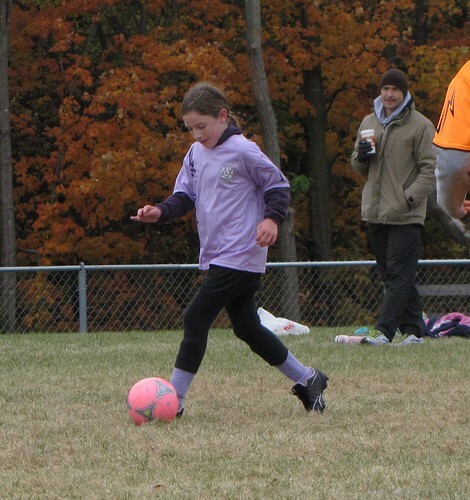 Hannah would love that – she absolutely loves to play soccer and is a pretty good player. Last fall she came to many of Becca’s practices and helped the coach out and even played goalie for Becca’s team during one game when they were short several players. We’re planning on having Hannah attend any of her soccer team’s practices and games that she can after her surgery, to cheer on the team from the sidelines. And hopefully her Girls on the Run coaches will let her stay as involved as possible there too, and I’m hopeful that she might even be able to at least walk part of the 5K in May, but we’ll have to wait and see on that. Want the whole (long) story? A (hopefully) final knee-related update!